They are scary and deadly. That’s what most people think when they become aware of the presence of a cobra. The snakes, known as ular sendok because the skin of their necks spreads like a spoon when they are about to attack, are indeed highly venomous. For Muhammad Nur Santosa, 28, however, the poisonous reptiles are part of his daily life. If any cobras are found lurking in the yard of his Yogyakarta home, the father hurriedly captures them, for the animals are his source of income. Almost every day, Nur Santosa butchers between 10 and 300 cobras to meet orders. The snakes are used for their skin, meat, gallbladders and marrow, which are in high demand for their supposed healing effects. “Sometimes I butcher 300 cobras a day and at other times none. Since November of 2011, I’ve slaughtered nearly 9,000 snakes,” Nur Santosa said. He keeps the reptiles, mostly supplied by hunters from various parts of Java, in cloth sacks. Nur Santosa’s method of butchering snakes is bold and rather dangerous. With his bare hands, the man pulls cobras out of their sacks one by one, decapitating them with a pethel (adze). “I just do it carefully, observing the movement of their heads. I’m not immune to cobra venom,” he told The Jakarta Post at his slaughterhouse in Sudimoro in Bangunharjo village, Bantul. After killing the cobras, Nur Santosa, with the help of his older brother, Wisnu Susilo, removes the skin and extracts the gallbladders. Nur’s mother, Sudiyah, removes the marrow from the bones. 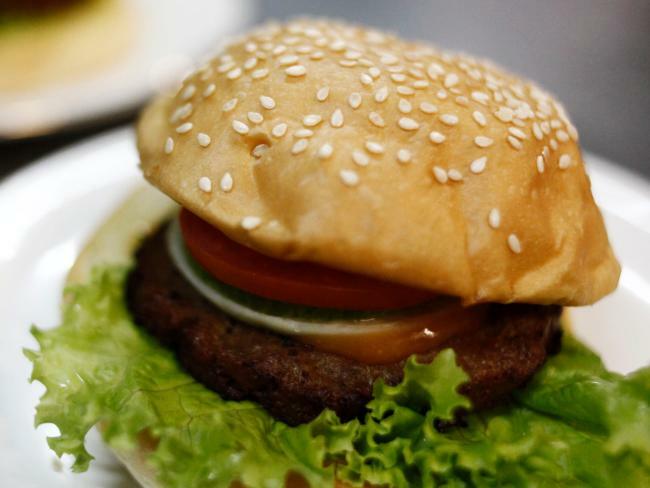 Cobra meat is purchased by restaurants that serve snake meat like Burger Cobra in Lempuyangan, Yogyakarta, at prices ranging from Rp 15,000 (US$1.65) to Rp 30,000 per kilogram. The marrow and gallbladders, believed to have therapeutic effects, are sold together at Rp 25,000. Some customers even consume them right at Nur Santosa’s home. “I eat cobra gallbladders and marrow once a year to make me healthy. They generate warmth in my body and I don’t catch colds,” said one customer, Jatmiko. 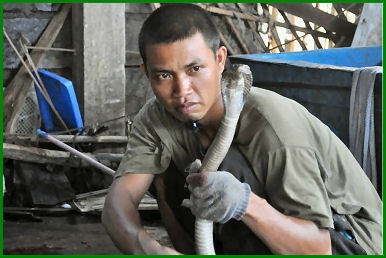 The fat of the reptiles is fried to produce cobra oil, which sells at Rp 5,000 for a 25 millliter bottle. The snakes’ entrails are sold to feed catfish. 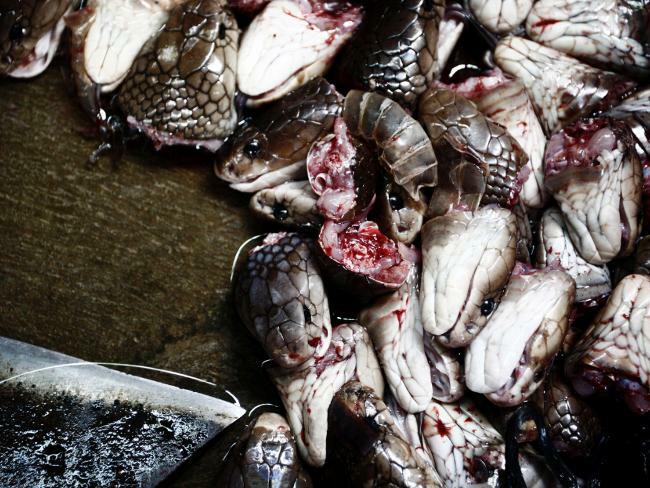 According to Nur Santosa, most of the cobras he butchers are delivered by suppliers in Boyolali, Central Java. “The Boyolali suppliers travel all over Java to get the snakes, which are sold to us at Rp 18,000 each,” he said. Once a management student at Pembangunan Nasional University in Yogyakarta, Nur Santosa became a butcher out of necessity. The snakeskin handicraft business founded by his father, Seger, in 1983 collapsed following the earthquake in Yogyakarta in 2006. One of their two snake butchers was killed in the disaster and the other was crippled. “Since 2006 I had to take over the profession as none of my family members dared to do the slaughter work,” said Nur, whose father’s production house and residence were ravaged by the quake, with the business’ entire capital lost. While the business had focused on snakeskin handicrafts, Nur Santosa shifted to the sale of snake meat, gallbladders and marrow. “I became too preoccupied with the cobra business to finish my studies. The important thing is I’ve got a job and cause no harm to other people,” he added. Asked if animal lovers ever opposed the cobra slaughter, Nur Santosa said so far he had not yet experienced any protests. But, he acknowledged the declining number of cobras caught due to their shrinking population. “I’m now butchering less than the former daily average of 300 to 1,000 snakes,” he said. In his view, the decreasing number hasn’t resulted from practices like what he is engaged in because snakes reproduce so quickly that the killing of snakes for food and medicine could have little impact. “The cause of the population decline is the shrinking habitat of snakes. A lot of farm areas have now been converted into settlements or shopping centers so that snakes have no more space for proper reproduction,” he pointed out. Yet, Nur Santosa is also aware that the killing of cobras will some day be restricted due to the expanding business of housing development, which reduces snakes’ habitats. The man opened a shop two years ago in preparation for that day. “My wife manages the shop and in case the cobra butchering business is banned, I can still support my family,” he said.